Alan Denney's photo film "Dalston v Thatcher", with its great soundtrack by Big Youth, will be shown in public for the first time at Cafe Oto, Ashwin Street E8 on Sunday 6th May from 7pm. 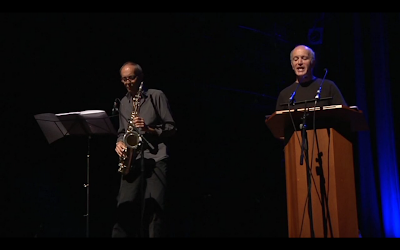 The projection is part of an OPEN event with Iain Sinclair and Anna Minton. This week Hackney has launched a competition, in the Architects Journal, to design two skyscrapers for the re-development of Colville Estate, Hoxton. The advertisement refers to a £25million project, featuring two towers of 14 and 20 storeys opposite Shoreditch Park, to "create interest in the skyline" and "drive the area's regeneration programme" (subject to planning permission). Will it be a return to the good old days? Just look at how that ended up. This photo is of the first of many tower blocks demolished by Hackney in the 1980s and 1990s. 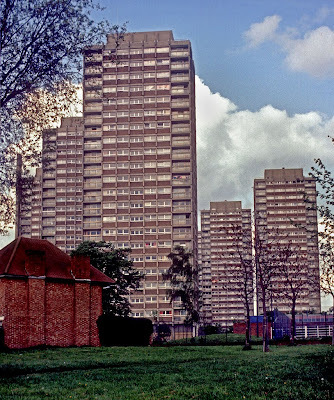 In addition to the Council's Trowbridge Estate, towerblocks were also demolished on Kingshold Estate, Nightingale Estate, Holly Street Estate and other estates. 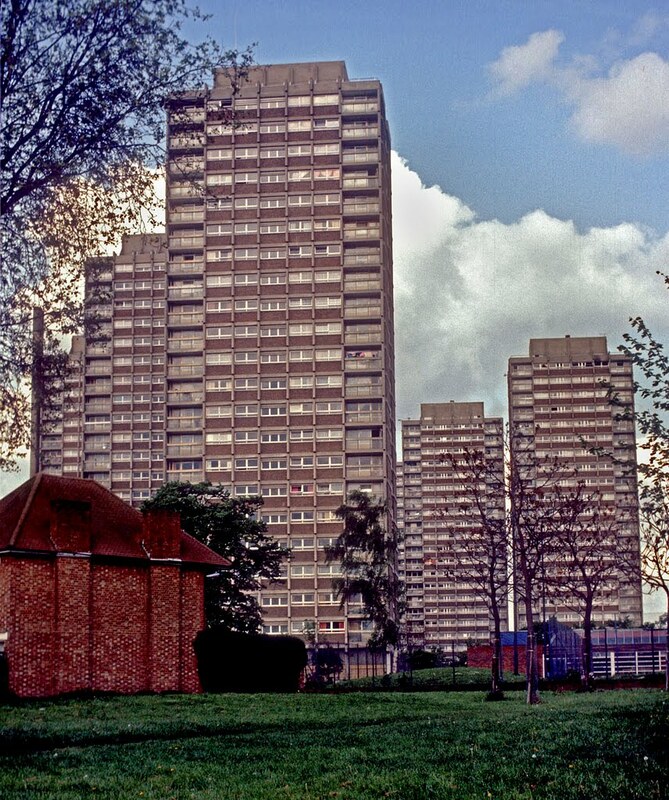 The Council found it impossible to maintain them as decent homes and the Holly Street towers acquired a reputation nationally as cockroach infested high-rise slums.Towerblocks were declared at the time to be undesirable for social family housing. 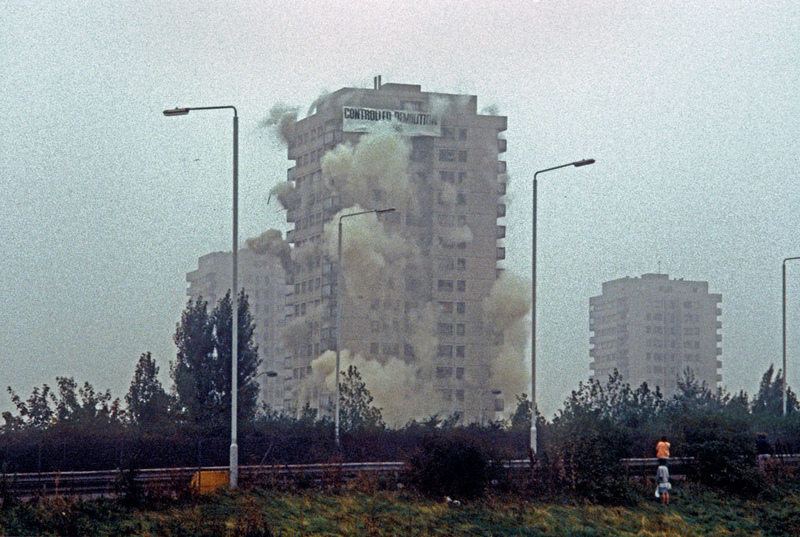 The demolitions were widely supported by local Tenants Associations, many of whom campaigned for demolition, and high-density low rise family homes were constructed in their place. 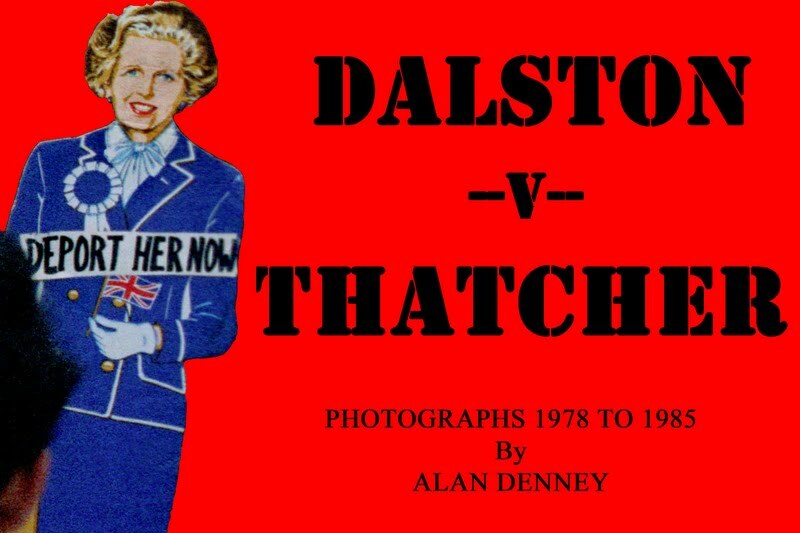 You can see more of Alan Denney's brilliant photo archive here. Hackney Council's Planning Department has today refused an outline application for permission to develop a 6-storey block on the corner of Kingsland High Street and Sandringham Road (the Tesco site at 130 Kingsland High Street) opposite Dalston's Rio Cinema. The planning application was refused using Council officers' delegated powers without being considered by its Planning Committee.The application was for a basement car park, ground floor retail, four floors of offices and 4 x 2-bed flats on the top floor. The decision follows the rejection last month of an 18-storey tower by nearby Kingsland Station. The application was strongly opposed by local residents affected by the development who lodged a petition and well argued written objections.The grounds of refusal included the absence of family housing; the obtrusive scale of the development which failed to respect local character and its detrimental impact on the Grade II listed Rio Cinema and the St. Marks Conservation Area; the overbearing impact and the loss of light and amenity to local homes; the poor quality living accommodation proposed; the excessive provision of car parking and the failure to provide an adequately eco-sustainable form of development. Two of contemporary Britain's most perceptive and lucid writers, Iain Sinclair and Anna Minton, will be presenting and discussing their work at this OPEN event which will start at 7pm on Sunday 6th May at Cafe Oto, Ashwin Street, Dalston E8. 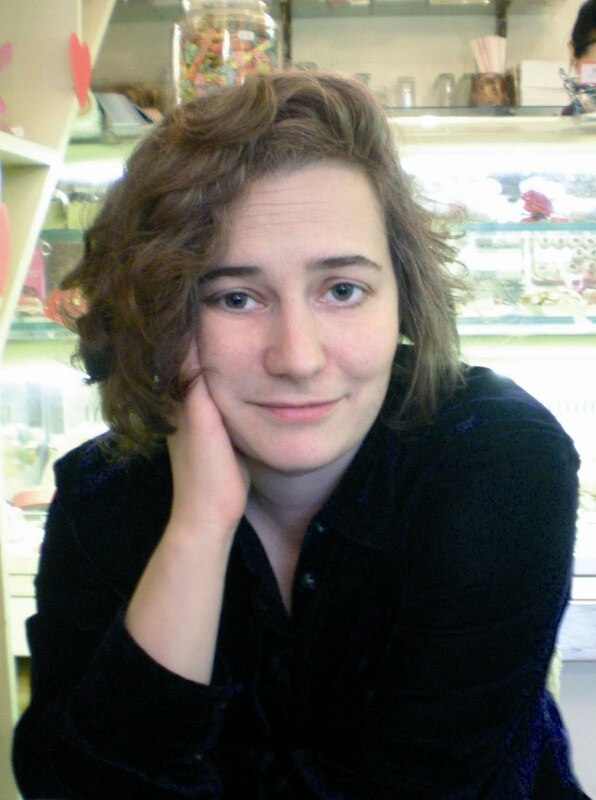 Multi-award winning writer and journalist Anna Minton's book "Ground Control - fear and happiness in the twenty-first century city" has been republished with a new chapter on our Olympic legacy. Described as a "revelatory and passionate defence against the privatisation of our streets and the disturbing reality of Britain today" Anna's book breaks the 'social silence' and reveals the answers to questions that few people have dared to ask. Writer, poet and film maker Iain Sinclair's book "Ghost Milk - calling time on the grand project" has now been published in paperback. Iain's book explores landscapes ravaged by vanity architectures shaped from smoke and mirrors. It has been described as Iain's "most powerful statement yet on the throwaway impermanence of the present". "CGI smears on the blue fence", he replies, "Real juice from a virtual host. Embalming fluid. A soup of photographic negatives. Soul food for the dead. The universal element in which we sink and swim"
"You can't write about this. They'll never believe it" Anna Sinclair warns Iain, her husband. But he did write about it. All of it. Ghost Milk. "A wonderful kind of alchemy is at work" J G Ballard observed in Sinclair's writing. The Sunday Times described his work as "remarkable, compelling, bristles with unexpected, frequently lurid life". 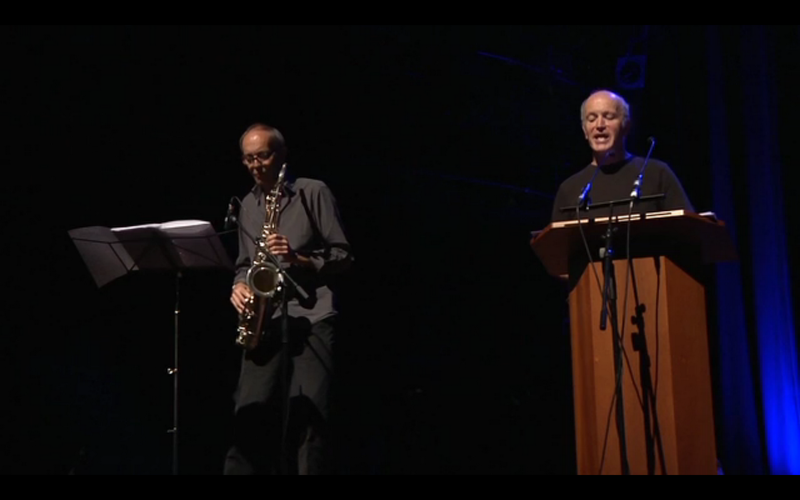 Iain and OPEN's founder & saxophonist Bill Parry-Davies will perform a new collaboration at the event. Followers of this blog will recall previous OPEN cultural events have been packed. We have presented Iain with Patrick Wright, the film maker Winstan Whitter with poet Michael Rosen, and a politico-cultural soiree at St Barnabus. Well, here's another unmissable one for your diary. You can get on-line tickets from Cafe Oto here ( for £5, or £3 for concessions) but otherwise there may be some left on the door.